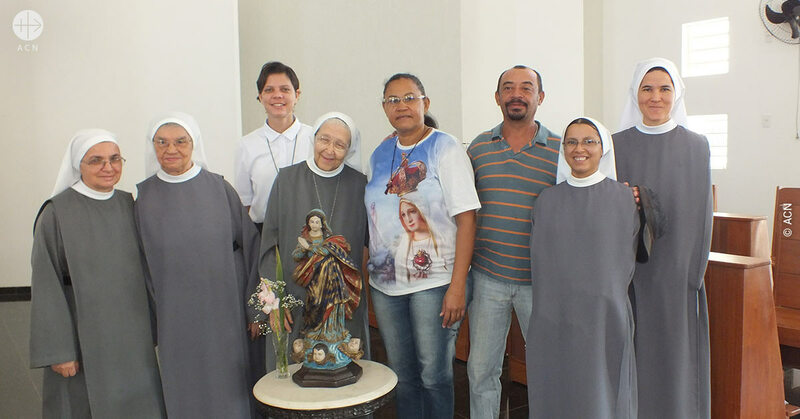 Mother Maria Aparecida and the other 14 Benedictine religious sisters are a perfect example of those beautiful “inner workings” which still further enrich the spirituality of Juazeiro do Norte, a town in the semi-arid region of the Sertão, in northeast Brazil. The Abbey of Our Lady of Victory, the first in the Brazilian state of Ceará, in addition to being a refuge of deep prayer and contemplation, is likewise a place of welcome for thousands of pilgrims who arrive in the city each year. The sisters open the doors of their convent to pray for and attend spiritually to all those who seek welcome beneath the image of Christ, the needy stranger. Mother Maria Aparecida in Abbey of Our Lady of Victory in Brazil, an Abbey helped by ACN since the beginning of the construction. For 15 years Mother Maria Aparecida was the abbess of the convent. Today, owing to her age, she is abbess emeritas. “I am the Benedict XVI of the community”, she explains jokingly. This joyful spirit, which she has retained throughout 54 years of convent life, is the fruit of a life history filled with “adventures of faith” as she describes the stages she has lived through over the course of her vocation. Coming from a family in which her parents were Catholics “in name only”, in other words who only thought of the Church when someone asked them what their religion was, she did not grow up with any close bond to the Faith in her infancy. 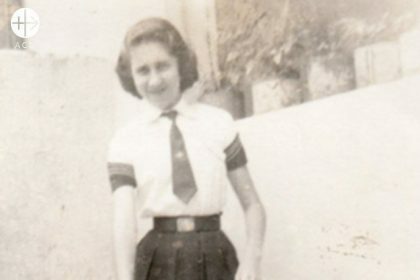 When she made her first Holy Communion, it was her own grandmother who was her catechist and taught her religion with great zeal in her own home from an old book, and she was also the one who sewed the dresses so that her grandchildren could receive the Holy Body of Christ for the first time. “But the only thing I retained from that time was the photo”, Mother Maria confesses, explaining that her true communion with Christ did not happen until some years later. One day, after ending a relationship in which there had been every indication that it would end in marriage, she took herself off to a church to weep. “That was the only place where nobody would ask me what was the matter”, she explains. But there was something more; in her desire to be alone she was beginning to become aware of a presence that filled her heart in a way that she had never experienced before. The youth of Mother Maria Aparecida. From then on her life began to change. The flirtatiousness that had been so much a part of her personality was beginning to give way to an air of modesty. The parties and the outings no longer satisfied her heart, and she began to become increasingly involved in the activities within the Church. This radical change in her astonished and alarmed her mother to the point where she decided to take her to see a psychiatrist. “Listen!”, the doctor told her. “I am an atheist, but what your daughter has is what they call a vocation.” God can make use of anything and anyone! 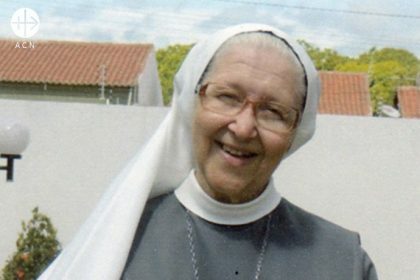 In addition to contributing to the construction of the convent, the international Catholic pastoral charity and pontifical foundation ACN provides regular maintenance support for these sisters, so that many more stories like that of Mother Maria Aparecida can be written, and so multiply within the Church these vocations which are so important for our times, and so that through them there may be more and more “hands” and “inner workings” of that “great timepiece” that is the Church.